Great Post from NIH Director’s Blog!!! Caption: The location and abundance of six proteins—e-cadherin (green), vimentin (blue), actin (red), estrogen receptor, progesterone receptor, and Ki67—found in breast cancer cells are seen in this multiplexed ion beam image. Cells positive for estrogen receptor a, progesterone receptor, and Ki-67 appear yellow; cells expressing estrogen receptor a and the progesterone receptor appear aqua. 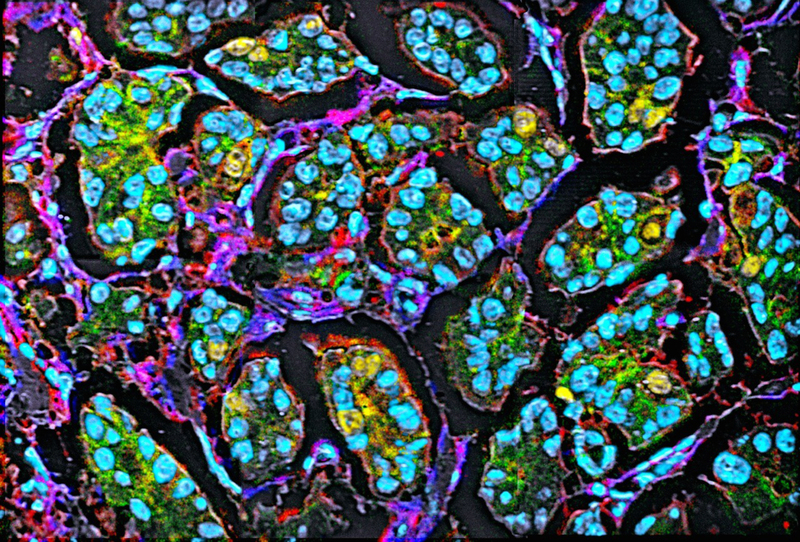 The artistic masterpiece above, reminiscent of a stained glass window, is the work of Michael Angelo—no, not the famous 16th Century Italian artist, but a 21st Century physician-scientist who’s out to develop a better way of looking at what’s going on inside solid tumors. Called multiplexed ion beam imaging (MIBI), Angelo’s experimental method may someday give clinicians the power to analyze up to 100 different proteins in a single tumor sample. ← A dose of reality about vaccines – Why vaccines work – @okaytobesmart Video!